Nexus devices feature a working, accesible UART port in rather interesting place - it is built into the headphones jack. Accessing the port is nothing new - there are several guides on the internets about this matter, I've used the one on blog.accuvant.com as a reference. Microphone pin in Nexus' headphone jack is connected to comparator, and if voltage on that pin exceeds certain voltage (blog post says 2.8V, but I had problems with that on Nexus 5), board/kernel switches R and L headphone ouputs to RX and TX UART lines. It operates at 1.8V and although the SoC would probably survive standard 3.3V UART<->USB converter many of you have laying around, it is better to make a voltage divider. ...it didn't work. After several hours I spent trying to fix the "board" I made (I'm a programmer and when I deal with electronics, it looks terrible and mostly doesn't work, so I kept thinking I soldered something wrong), I finally tried to attach the MIC pin directly to +3.3V from my UART<->USB converter, and suddenly, it works. So, voltage of ~3.0V on MIC pin is not enough to trigger the UART mode on Nexus 5. 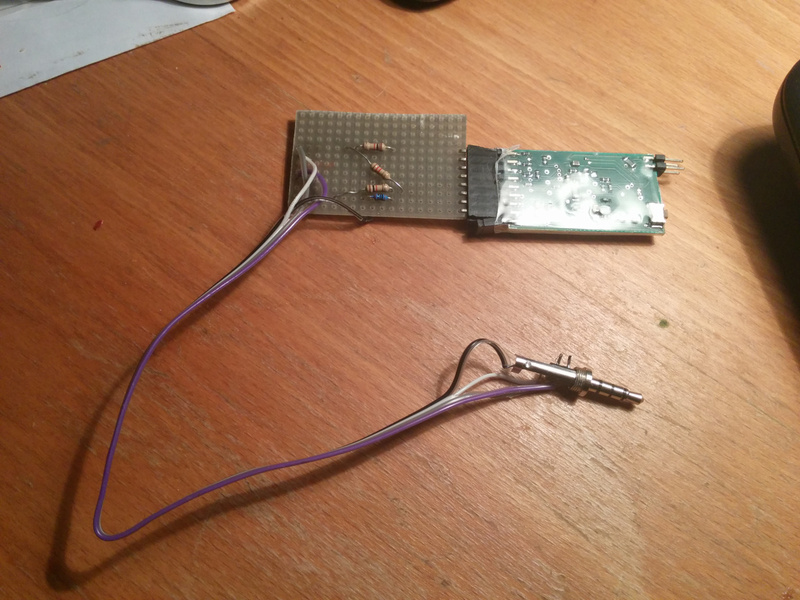 3.3V works fine and enables the console (on MIC pin - RX/TX still should be at 1.8V). Continuous splash enabled, keeping panel alive. I happen to have also the Nexus 7s (both 2012 and 2013 version), so I've tried this thing on both. On 2013's model (boardname flo), it works fine, except you need to add console=ttyHSL0,115200,n8 to cmdline in boot.img. It is already there, but bootloader removes first 26 characters of cmdline before passing it to kernel (lol), which is exactly the lenght of "console=ttyHSL0,115200,n8 ". Probably an attempt to disable the UART console as it _might_ be a security risk (and it works, you need to unlock the bootloader if you want to modify cmdline, but it is just funny). On 2012's model (boardname grouper), it doesn't work with my setup. It puts too big current on the MIC line, which triggers a fuse on my UART<->USB converter (the fuse is 50mA), which then turns off the 3.3V source. I have no idea why, I'm pretty sure the HW part is there, I saw it mentioned in the kernel several times. It does the same thing while in bootloader. I'm currently trying to make kexec-hardboot patch work on Nexus 5 for my multi-booting tool MultiROM and serial console helps me debug very early stages of kernel's boot process. To get it to Google search results. It took me long time to figure this out, so I want to let others know it works. To by mě zajímalo, jak přepínaj mezi analogem a digitálem. Na straně 233 je pak schéma zapojení okolo sluchátkového jacku. Je tam použit digitálně řízený analogový přepínač/multiplexer FSA2269UMX, pro ty co by si s tím chtěli hrát existuje něco podobného v CMOS řadě 4000 a to 4016, 4066. Rozhodně to nemá stejné vlastnosti, jen jsem chtěl poukázat na něco dostupnějšího. Díky za info, ono se ani nic jinýho čekat nedalo. Na schématu je vidět, že se porovnává napětí na mikrofonním vstupu dělené na polovinu (děličem 10k/10k) s napájecím napětím 1V8 děleném v poměru (56k/66k), tedy 1V52. Takže při nominálních hodnotách součástek musí být napětí na vstupu aspoň 3,04 V, když přidáme nějaký rozptyl, je jasné, že je potřeba tam připojit 3,3 V.